When sharks and pirates block Scrooge McDuck from the mother of all treasure maps, only noisy nephew Donald can break the impasse ... or can he? It s Fantagraphics third complete, chronological book of Duck epics by Don Rosa following in the footsteps of Disney legend Carl Barks with his own stunning, seaworthy style! 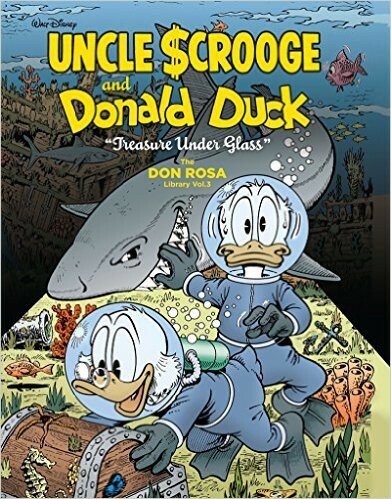 Standout stories in this latest Scrooge and Donald volume include Treasure Under Glass: a tale of ships, scoundrels, and the world s biggest diving bell! Then War of the Wendigo pits Scrooge and the Peeweegah Indians against a piggish profiteer while in Return to Xanadu, a quest for Kublai Khan s gold leads the Ducks back to Carl Barks lost world of ... ah, but that would be telling! Presented with brilliant color and a treasure trove of Rosa s cover art and behind-the-scenes factoids, these Duckburg epics are getting a definitive, comprehensive North American edition for the very first time at a bargain price worthy of Scrooge himself!